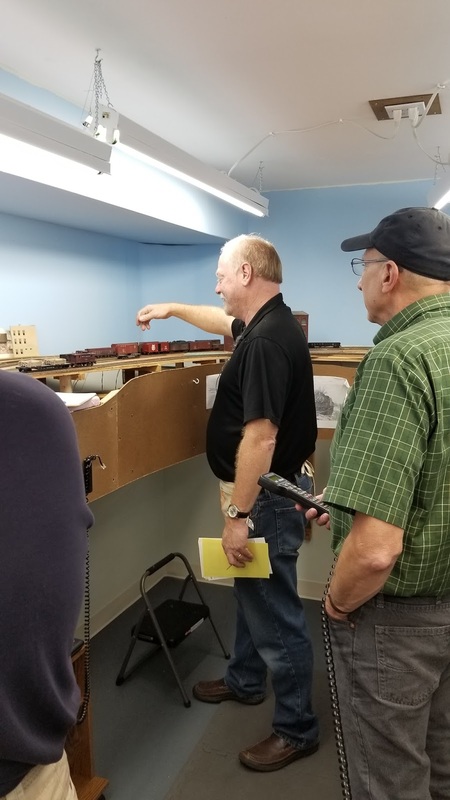 The Valley Local: Milestone Monday - First Full Ops Session! Ah Labor Day - the "unofficial" end of summer and swimming in the pool. I'm not a swimmer myself, but I know the feeling of trying to get to the other end of the pool, head down, working hard towards my goal when . . . I hit my head on the wall at the other end of the pool. It's only then that I know, well and truly, that I finally met the goal I was working so hard to reach. That's kinda what it was like during my latest operating session on the Valley Line. But "pay" comes in many forms and having folks over to take a ride in the time machine I'm attempting, and the fun and feedback I get in return - not to mention seeing my creation come to life - is priceless. 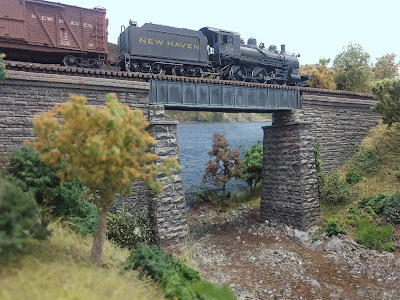 And during the most-recent session - and for the first time since doing the final expansion and all the shakedowns - I realized that the layout was coming to FULL life before my eyes: all four local freights operated with full two-man person crews (including the two Shoreline locals), "New London" and "New Haven" fully crewed and operating sixteen mainline trains through the Saybrook interlocking (run by fast clock according to the actual Sept. 26, 1948 prototype timetable), all coordinated (and not without a little stress) by yours truly in the Saybrook tower. I had no idea until that moment that I'd reached such a milestone. I'd been working so hard and diligently towards this point that I almost missed its significance - until the realization hit me upside the head. Thankfully, the session went really smoothly with only a few minor/inevitable glitches - all easily remedied for next time. After putting the layout through its paces so many times already, those gremlins are becoming ever more rare and the "punch list" becomes more a matter of minor tweaking and adding more realism to the sessions. Even the aisles weren't too crowded (at least not for long periods) despite having eleven (11!) folks operating at the same time. If there was any downside at all, it was that I was too busy during the session to really visit or take photos. Fortunately, we were able to visit during pizza beforehand and the Missus made a cake for afterwards. And for photos, a lot of folks chipped in with the pics they took. Thanks to them, I have a little recap of the session, told through photos and captions . 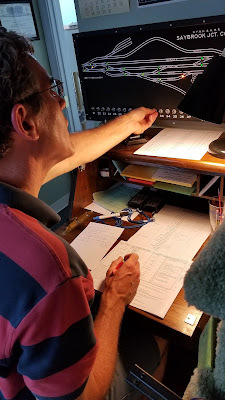 . .
Last minute prep: Bill brought over a fantastic printout of a New Haven RR Train Bulletin, created from a prototype photo I'd found of the actual one in the Saybrook station. Yes, of course all those trains stop at Saybrook during a typical operating session - all according to the actual timetable the New Haven Railroad issued September 26, 1948. 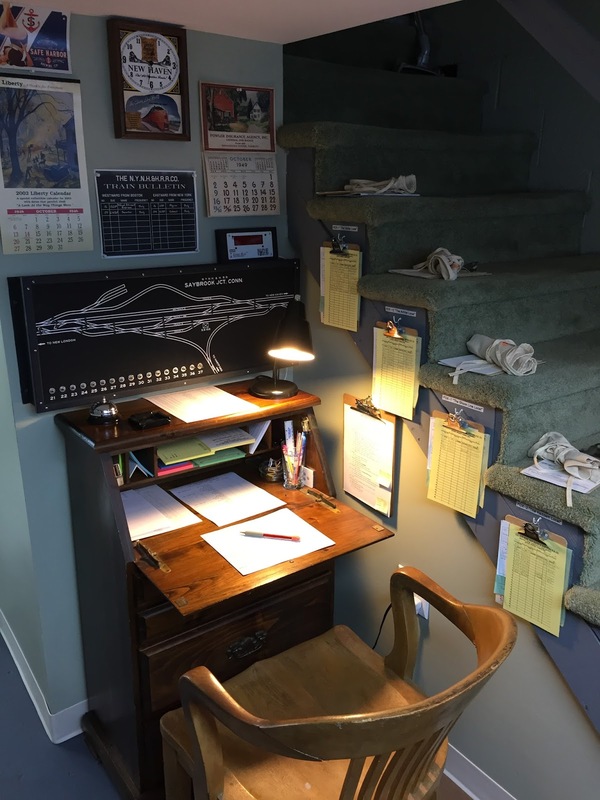 I took this photo before all the chaos started - looks oh so tidy: Four clipboards containing paperwork for each of the four locals, including additional tools/helps on the steps, and the A/O-Towerman's desk all ready to go. This view shows tracks 7 & 5 (left to right - NHRR track numbering) with cars spotted for the Shoreline locals. 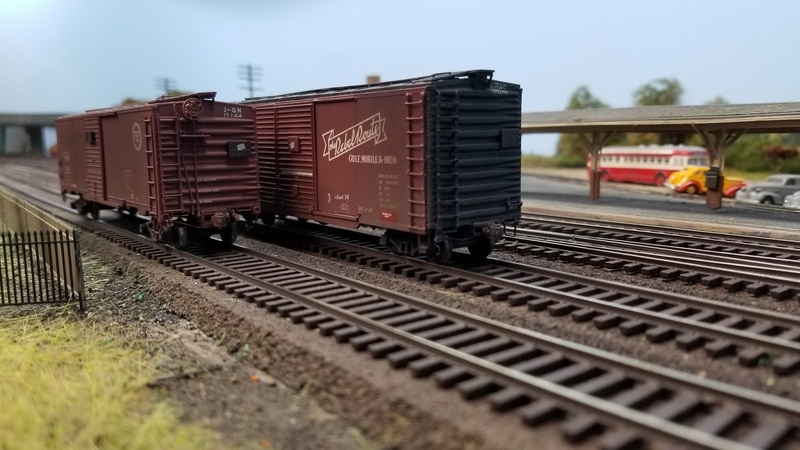 Track 7 is where cars destined for points east of Old Saybrook are spotted for Providence Division Extra #1 (PDX-1, the eastbound local freight from Cedar Hill Yard/New Haven to Fort Yard/New London). Track 5 is for the westbound cars, spotted for PDX-2 which works from New London to New Haven - as well as up the Valley Line to East Haddam. View showing cars spotted at The Chapman Co. ("Coal-Coke-Oil") and the Saybrook freight house. Interior of the Saybrook Tower, showing the interlocking levers and "me" at the desk (click to enlarge). Modeling courtesy Bill Schneider. And "actual" me at the Saybrook Tower desk, aligning switches for the next Shoreline express passenger train scheduled to speed through. The Valley Local (Hartford Division Local #7 - aka HDX-7) starts off the session since it has the most work - up north on the branch and far away from the busy Shoreline. 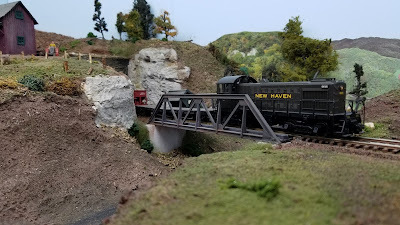 It leaves Hartford yard and heads south through Wethersfield and here the line crosses over the Goff Brook and into the town of Rocky Hill. 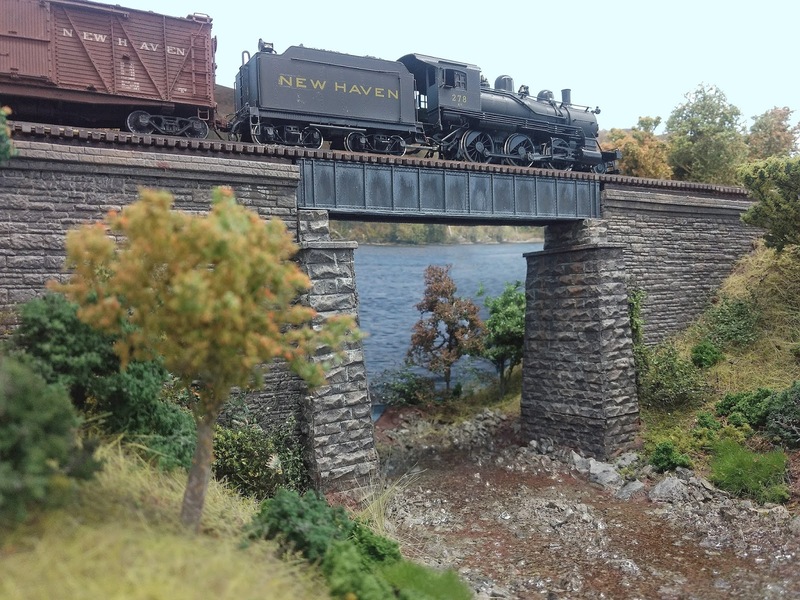 While Bill did the scenery and bridge abutments, I can lay claim to the bridge itself and the "storied blogged" farmhouse. After crossing Goff Brook, the Valley Local continues south and rounds the curve north of Rocky Hill station (observing the 10 m.p.h. speed restriction, as indicated in the timetable). Southward view as the local enters Rocky Hill. 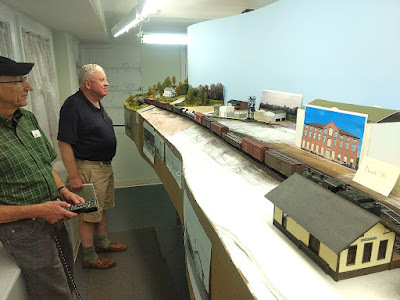 Valley Local in Middletown, with Bill acting as conductor/brakeman while Jim operates the throttle. The Airline Local must be in town as well since Kaylee took the photo and you can barely see Greg on the left. The two locals exchange cars at this point. 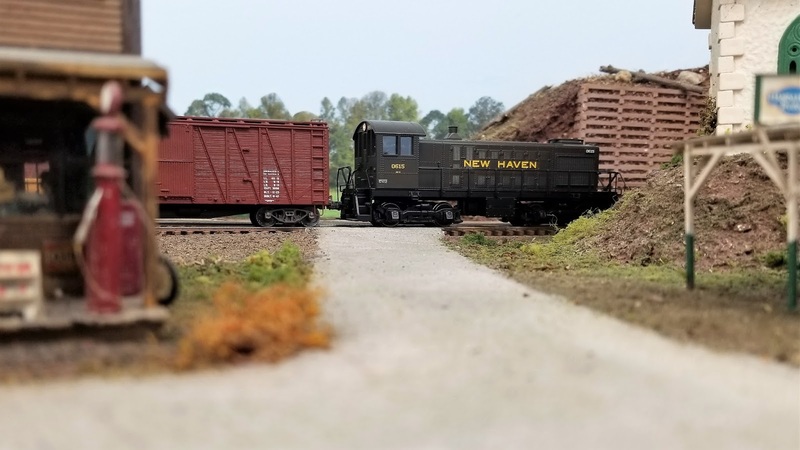 After the Valley Local finishes its work in Middletown, depending on the day of the week it heads either further south to East Haddam or up the branch to East Berlin. This shot shows the local heading south over the bridge at Shailerville (a section of Haddam, CT). That's the Connecticut River in the background. 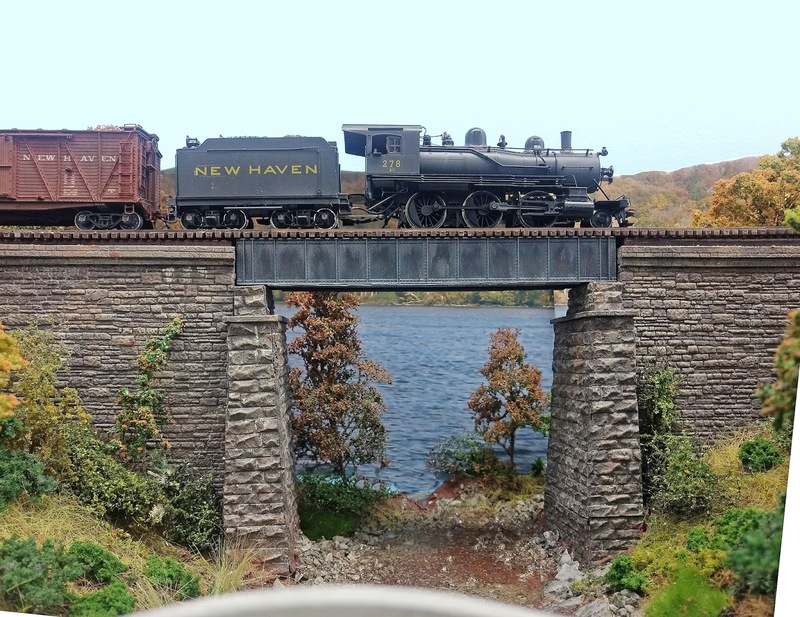 This location, with its high bridge and distinctive abutments, is the scenic highlight on a line known for its wonderful scenery. It doesn't hurt that the Middlesex Turnpike (today's Rt. 154) is right alongside, affording easy access and a great view of the train passing by. 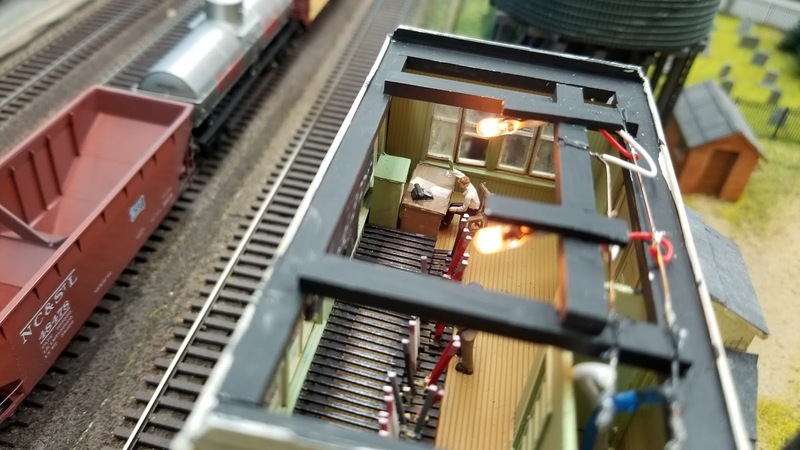 Attesting to its popularity among railfans, here we see Kaylee shooting the local as it heads back north after making its swap of cars with the Shoreline Local in Haddam. You can just make out the Turnpike and the Shad Shack by Kaylee's right hand. After HDX-7 finishes its work in Haddam, it high-tails it back north to keep from outlawing. But it still has to pick up any northbound cars it had left along the way, so by the time it gets back to Wethersfield the local looks more like a through freight - as you can see in the photo above. Jim's taking everything the mogul's got and Greg must be wondering whether the old girl will make it. But the story of the Valley Local ends well - they made it back to Hartford in time for dinner. 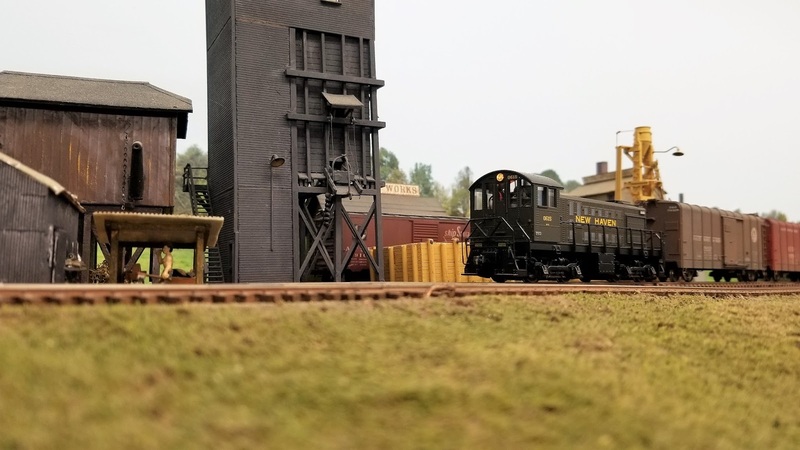 Meanwhile, the Air Line Local has been busy working the (fictional) towns of Somerset and Mill Hollow on its way to swap cars with HDX-7 in Middletown. The photo above was shot just as the local was leaving Somerset on its way east. We catch it again as it emerges from the tunnel and crosses the bridge at Draper (a flag stop on the way to Mill Hollow). The crew must've been too busy to get any photos in Middletown, so we don't catch HDX-12 again until it's on its way back west to Cedar Hill yard. Here it is rolling past the engine facilities at the west end of Somerset. Since the Airline recently dieselized, the writing is on the wall for these distinctive buildings. Finally, we see the two Shoreline locals - PDX-1 & 2 - doing their thing in Saybrook. Roman's manning the throttle on PDX-2 as Pieter gives signals. Pete looks on in the background, likely anticipating the arrival of yet-another Shoreline express. Bob, from PDX-1, and Roman with Greg and me in the far background. That must've been when I was trying to get HH660 0924 started. Unfortunately, there aren't any photos of the unsung Heroes of the Shoreline - Randy and Tom, who spent the session "offstage" firing mainline trains at each other, each salvo followed by the eyes of those looking on (usually from the "bleachers" - the best seats in the house, aka the basement stairs). And here's (kinda) where the session ended - PDX-2 (aka the westbound Shoreline local, aka The Haddam Local) sits on the west leg of the Saybrook wye, waiting for clearance to enter main track 1 and get on its way to Cedar Hill, while yet-another Shoreline express rolls by westbound. Normally, the session ends when PDX-2 gets to New Haven. But they got to Saybrook right about when the afternoon rush started - they weren't gonna be able to get a clear track for a while. So we decided to call it a night. leave them on the wye, and head upstairs for cake. Ah, cake - a fitting way to cap off a milestone evening, even if I didn't realize its full significance until the end. 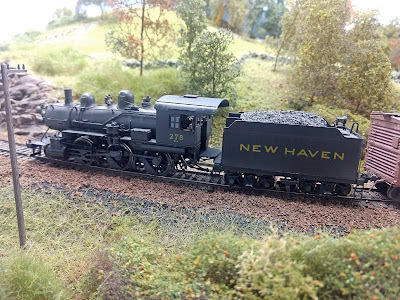 A big thanks to regulars Bill, Randy, Tom, Pete, Pieter, Roman, Bob, and Greg, and to special guests Jim and Kaylee for doing such a great job in taking us all back to do some railroading in the lower Connecticut River Valley in the Autumn of 1948. Wow, Congrats on what is certainly a milestone. Great blog post, thanks for sharing! Thanks very much Craig! I hope you're able to make it to a session soon!